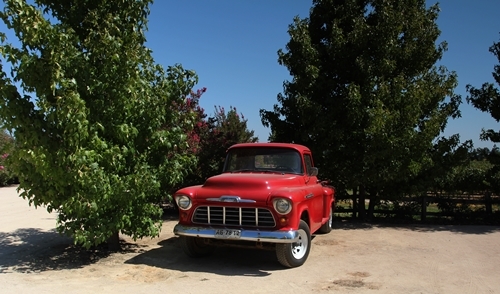 Aurelio Montes and Douglas Murray, two of the original founders, made the first vintage of their Cabernet in 1987. 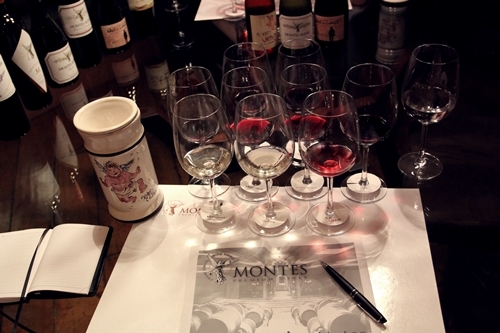 It was the first premium wine to be exported from Chile, their breakthrough and the beginning of Montes Wines. The partners have over 25 years inspired and changed a whole industry with their original take on marketing, branding and winemaking. 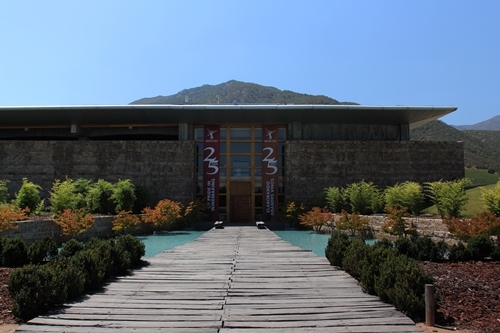 The design of their winery in Apalta, Colchagua, follows the principles of Feng Shui, since one of the partners were very passionate about Eastern culture and spirituality. 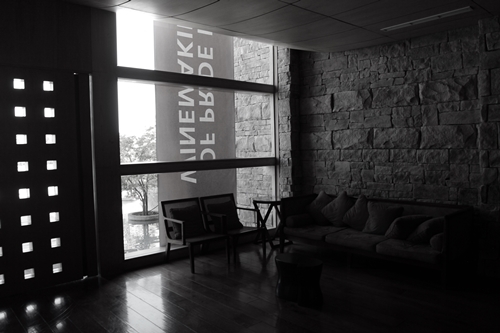 Visiting the winery will make you appreciate at least some of the principles; like the continuously flowing water. 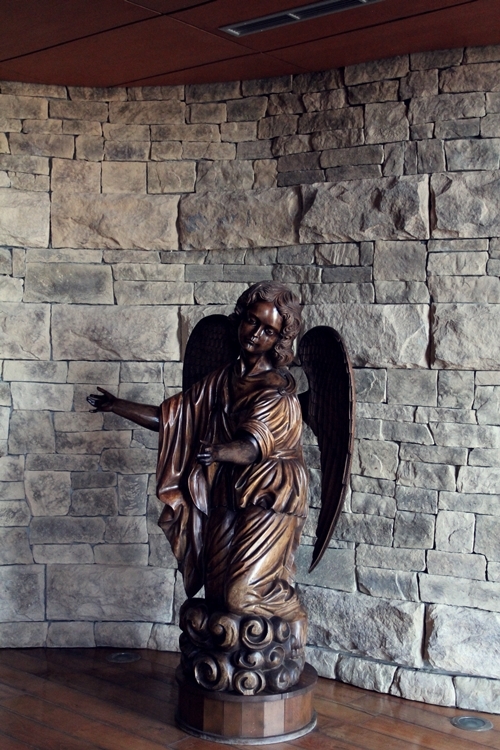 The sculpture in their lobby is one of many angels attached to Montes Wines. 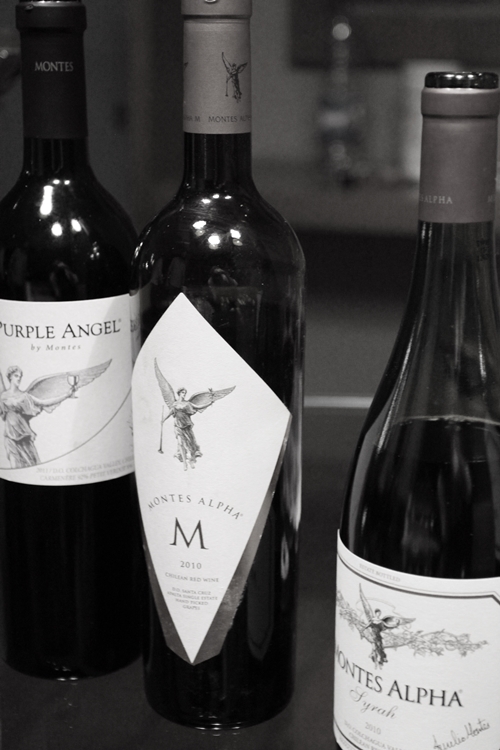 Through the years the angel figures have become almost synonymous with their premium and ultra-premium wines. Here the calm and peaceful lobby. The view from one of their hillside vineyards (looking south east, with their Apalta winery near the centre of the picture). I was fortunate enough to have their Chief Winemaker of their Apalta Winery, Jorge Gutierrez, show me around. 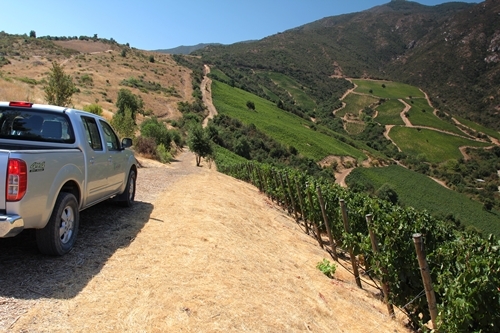 This meant climbing some seriously steep vineyards in his 4×4. Perhaps one gets a glimpse of how steep some of the vineyards are. Driving around them, Jorge only admitted once being worried, that was when we mistakenly took a dead-end and had to reverse the truck several hundred metres. 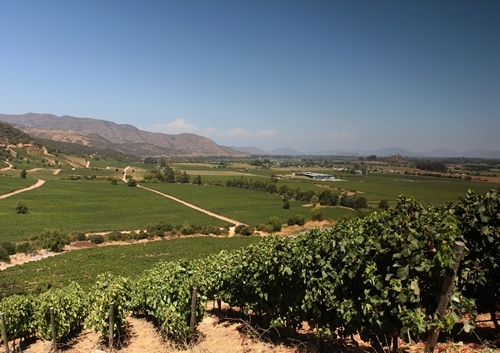 Driving up their hillside vineyards gives you a great overview of the Apalta sub-region, and some stunning views across the valley. 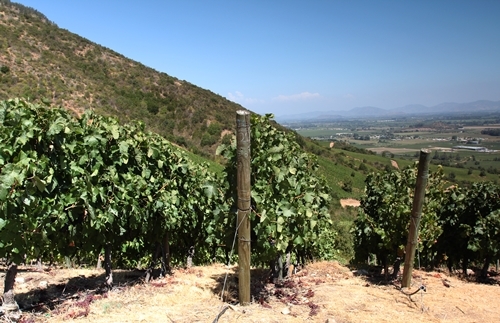 Their vineyards are “naturally” maintained and harvested by hand. Jorge Gutierrez, Chief Winemaker of their Apalta Winery, and in charge of their Icon wines (with guidance from Aurelio Montes). It is also possible to trek around their surrounding grounds, which is privileged by having unique flora and indigenous plants native to Chile. 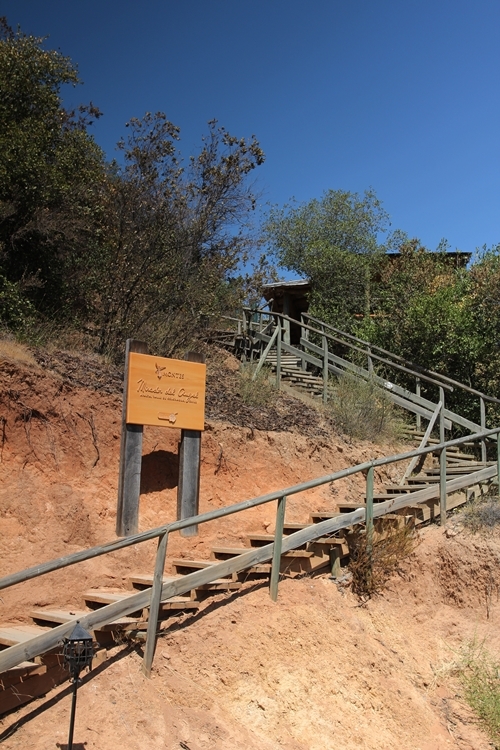 Here we see the stairs to their terrace and starting point of the pathways, which will take you up “Divisadero Hill”. The beautiful Corvette trucks, sitting on their parking lots, tell the story of one of the partners’ love for vintage cars. Moreover do the trucks not only make for decoration as they are still driven. 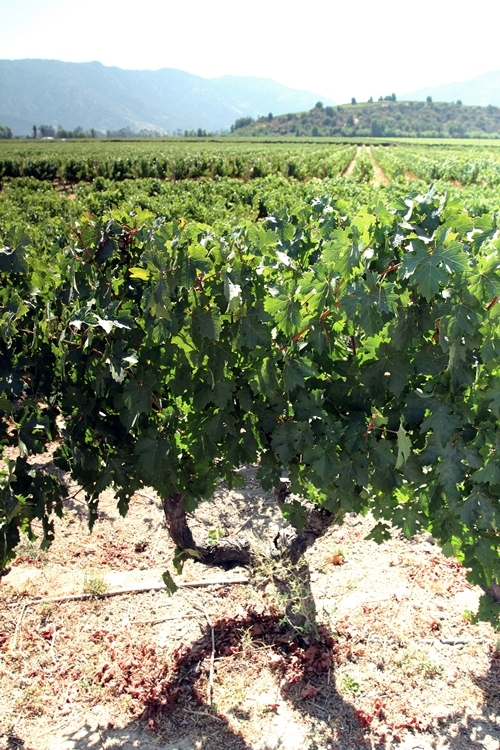 One of the older vines from their first plantation of the Estate. 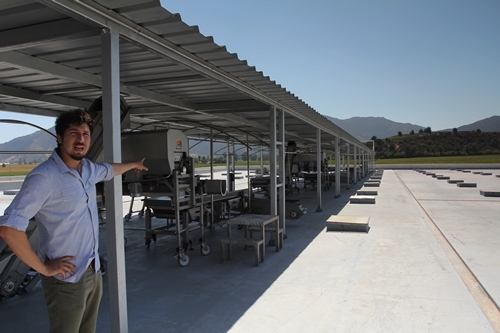 Here Jorge shows us the machinery found on the roof of their Winery, where they receive, pick and sort the grapes, before filling the tanks (found underneath) by gravity flow. 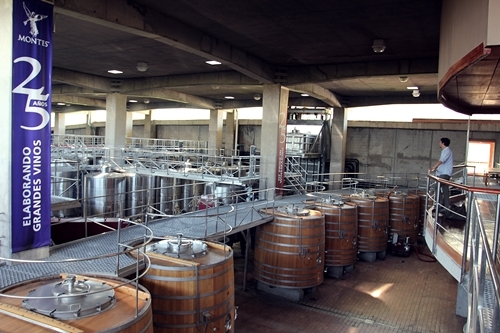 Their tank room (Jorge Gutierrez is seen standing on the bridge). 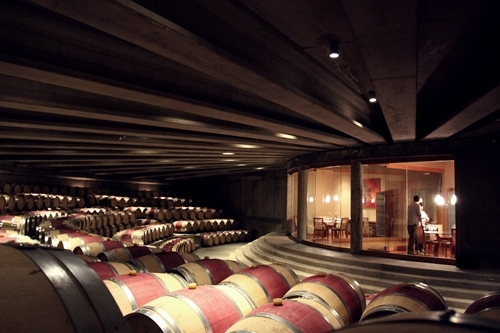 Their stunning Barrel Cellar is found in the north end of the winery. An eccentric twist is the classical music, which is played 24 hours a day, both to set a mood and to create good Qi (energy) after the Feng Shui principles. 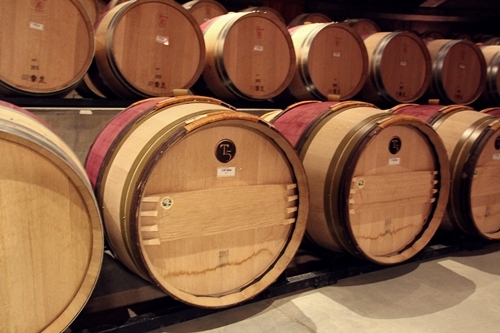 Behind the glass wall, and conveniently close to the barrel room, we find their two private tasting rooms. These beautiful barrels keep their new Super-Icon called “Taita”. It is a blend of 85% Cabernet Sauvignon from their Marchique Vineyard, and 15% kept unknown to the public. A very limited production makes it rare and pricey. A thorough tasting of their current releases, showcased many delicious, and pleasant wines. Their Alpha Range showed in particularly excellent value. Of their 3 Icons, we sampled two of them; their elegantly styled Cabernet Blend “Alpha M”, which might win you over on first encounter and the extremely pleasing Carménère Blend “Purple Angel”. Their Syrah based Icon “Folly” was not included, it is though highly recommended by critics for its original intense palate, and it is from their lowest yielding vines on the steepest hillside vineyard on the Apalta property (with a more than 45 degree slope). The Cabernet based Blend “Alpha M” is the priciest of the 3 and definitely the most elegant. We tasted the 2010 vintage, which is regarded a very good year equal to 2011, because of its relatively lower yield. The Blend is of 80% Cabernet Sauvignon, 10% Cabernet Franc, 5% Merlot, and 5% Petit Verdot from their steep Apalta Hillside Vineyards. Aged 18 months on new French oak. The colour is dark, inky deep, and it coats the glass with velvety thick tears when you swirl the wine. Clearly still a very young wine, which demands proper decanting before it is served. Its nose reveals its birth in granite soils, and it has complex layers of red berries, cassis and a hint of cinnamon. The palate is strong and concentrated, yet the tannins are still very soft and elegant. 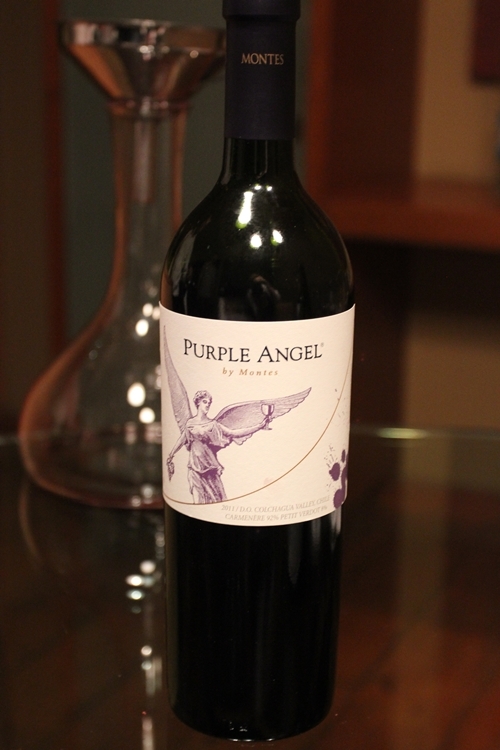 The Carménère based blend “Purple Angel” was such a pleasant surprise. It is the most recent of the Icons to be added to their portfolio, as it was not added until 2003. 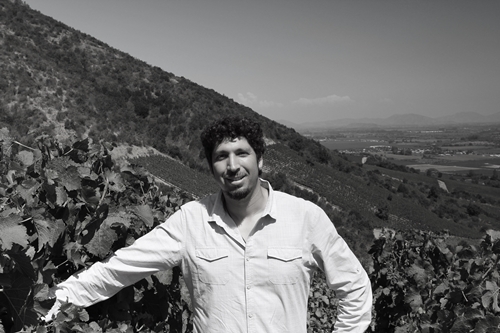 Jorge describes the 2011 vintage as a very good year, similar to the excellent 2010. 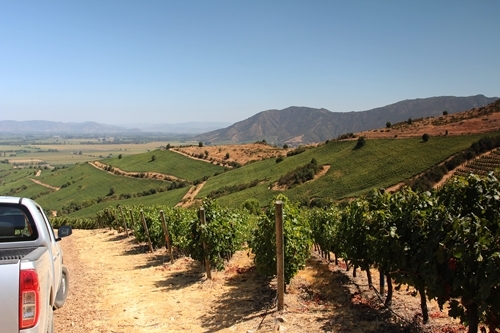 The blend is of 92% Carménère and 8% Petit Verdot, sourced from their two Colchagua Estates; 50% from the Apalta Estate, and the other 50% from the Marchique Estate, where the cool coastal climate naturally gives low yields in the vineyards. Also spent 18 months on new French oak. It is definitely a wine that needs decanting/cellaring before it will reveal its true potential and umami characteristics. The wine has an extreme density and a stunningly purple colour in the glass. On the nose you get spicy hints of green peppers and barbecue to begin with, later on when it opens, its structure and polished notes uncovers, along with a delicious palate of dark chocolate, wild berries, and spicy fruit. A thoroughly pleasing wine!